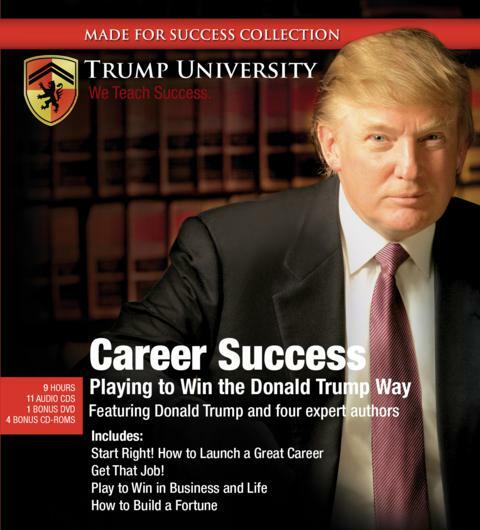 Maximize your career success with the help of an expert team of been-there, done-that teachers assembled by one of the most successful wealth-builders of our time: Donald Trump! With Career Success, we start with identifying the perfect career title to match your passions, skills and interests. This interactive audio program with powerful software will serve as your workbook to identify the perfect job to fit your personality. You will get modern tips for creating the perfect resume and submitting it through the “hidden job” market. We give you to the tools to find the perfect job, even in a tough job market. Learn the tools to create an irresistible resume. So you got the interview – now what? Learn the formula for how to be yourself, avoid canned answers, which experiences you must talk about and questions you can expect…and HOW to answer them. Learn the art of salary negotiation and what is appropriate for your position. Do not forget to ask for your signing bonus – we will teach you how to do this and all you need to negotiate a lucrative pay package. Then, once you land your dream job you will learn to tools to move your career forward. Did you know that 70% of college graduates are unhappy in their job? This does not have to be you. Donald Trump gives you to tools to turn your job into a passionate pursuit with many rewards along the way. Donald Trump will teach you to earn a fortune in business by creating the perfect offense for your professional life. In this breakthrough program, you will draw inspiration from great football teams to demonstrate exactly how you can reach your biggest goals. Football players combine vision, passion, and consistent discipline to achieve championship status. The same applies to successful individuals in all walks of their professional life. Founder and chairman of Trump University, he’s the most successful real estate developer in the United States and a dominant figure in the business world. As best-selling author of seven books and star of “The Apprentice” television series, Trump serves as a mentor and inspiration to millions of people worldwide. A graduate of Canada’s University of Lethbridge, Andrew is devoting his career to helping students and young professionals maximize their potential. With Luc D’Abadie, he is co-author of The Power of Focus for College Students and co-founder of Focused Futures, whose mission is to help students make college the best investment of their life. Co-author with Andrew Hewitt of The Power of Focus for College Students and co-founder of Focused, Futures, Luc also owns a seminar company and writes a monthly column for subscribers in more than 10 countries. The founder of Advanced Interviewing Solutions a company that helps job seekers secure top-paying and satisfying employment, Eddie’s patented system prepares individuals to interview and obtain job offers in the most efficient, fun and confident manner possible. He has taught his system at colleges, universities, businesses and community centers nationwide. Known to thousands of readers through his book, The Power of Focus, which he co-authored with Jack Canfield and Mark Victor Hansen, Les is also a contributor to Donald Trump’s audio business course How to Build a Fortune. An entrepreneur for 25 years and top performance coach, Les has a passion for sharing leading edge strategies that dramatically improve the quality of life-and the bottom line.